Project Coordination is pleased to announce that it is the winner of the 2007 Integral Engergy Illawarra Business Awards – Building and Construction Company of the Year. The Integral Energy Illawarra Business Awards are one of the most recongnised celebrations of business success and endeavour in regional Australia. It is an impressive achievement to win this prestigious award, particularly taking into account the competitive nature of the awards and the strict judging guidelines. The assessment criteria included proven demonstration of Leadership, Strategy and Planning, People and Staff, Marketing, Quality and Improvement, Success and Sustainability and Compliance. 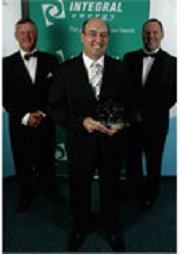 The award was accepted on behalf of Project Coordination by the NSW Manager and Company Director Steve Morgan before one thousand people who attended the gala awards night held at the WIN Entertainment Centre in Wollongong on 16 November 2007.